Today we have released VisuMap 3.0. This is a major upgrade from the previous version 2.7. Atlas service in VisuMap is thus similar as dashboard service in some other visualization centric software applications. It allows users to group visual information according to the subject instead of information type itself. 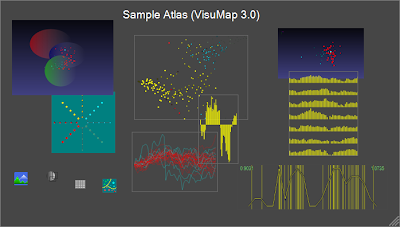 And more importantly for VisuMap users, atlas service enables users to combine multiple algorithms to generate and compose heterogeneously structured information visualization. For instance, this release includes a script (PartitionAtlas.js) that automatically partitions a dataset in several clusters, and generates various maps for each cluster. Together with this release we have extensive updated the scripting interface. Unfortunately, some old scripts may need minor adjustments to convert to this new release. We have also extended the data format extensively to accommodate the new service. However, the data format has kept compatible in the sense that old dataset files can be loaded into new version, but datasets of new format can not be read by previous versions. Here is another video that shows how a script uses kmean algorithm to partition a dataset and generate different data views for the partitions. This video shows using pre-configured SOG cluster to create mutiple data views for a dataset.